Delicate perforations adorn these stylish mary jane shoes, ensuring a soft, flexible fit. A tapered wedge adds just enough height, bridging the gap between wok and weekend-wear. Like its namesake city, Osaka bring together modern styling while paying homage to a traditional silhouette. 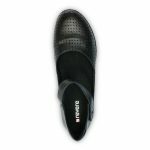 These orthopedic shoes for women feature a removable insoles which allows for the insertion of custom orthotics.